Asadzadeh, S., Aghaie, A., Yang, S. (2008). Monitoring and Diagnosing Multistage Processes: A Review of Cause Selecting Control Charts. Journal of Industrial and Systems Engineering, 2(3), 214-235. Shervin Asadzadeh; Abdollah Aghaie; Su-Fen Yang. "Monitoring and Diagnosing Multistage Processes: A Review of Cause Selecting Control Charts". 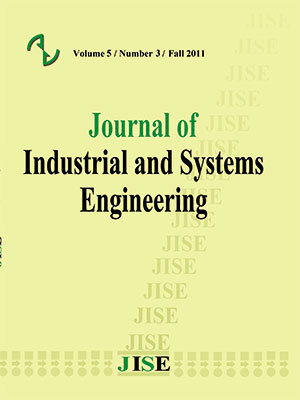 Journal of Industrial and Systems Engineering, 2, 3, 2008, 214-235. Asadzadeh, S., Aghaie, A., Yang, S. (2008). 'Monitoring and Diagnosing Multistage Processes: A Review of Cause Selecting Control Charts', Journal of Industrial and Systems Engineering, 2(3), pp. 214-235. Asadzadeh, S., Aghaie, A., Yang, S. Monitoring and Diagnosing Multistage Processes: A Review of Cause Selecting Control Charts. Journal of Industrial and Systems Engineering, 2008; 2(3): 214-235. 1Department of Industrial Engineering, K.N.Toosi University of Technology, Tehran, Iran. 2Department of Statistics, National Chengchi University, Taiwan. A review of the literature on cause selecting charts (CSCs) in multistage processes is given, with a concentration on developments which have occurred since 1993. Model based control charts and multiple cause selecting charts (MCSCs) are reviewed. Several articles based on normally and non-normally distributed outgoing quality characteristics are analyzed and important issues such as economic design, autocorrelated processes and adaptive design parameters of cause selecting charts are discussed. The results reveal that cause selecting charts outperform traditional Shewhart charts for individuals when the process steps are dependent, in view of the relationship between input and output quality characteristics. A new method for modeling and simulating a multistage process is proposed which can prove to be more reasonable in real practice. Finally, various directions for future research are given. Dipaola P.P. (1945), Use of correlation in quality control; Industrial Quality Control 2(1); 10-14. Reliability Engineering International 19(6); 477-491.
shifts for multiple stage processes; International Journal of Production Research 45(23); 5547-5570.
correlated data; Quality and Reliability Engineering International 18 (6); 489-496. Mandel B.J. (1969), The regression control chart; Journal of Quality Technology 1(1); 1-9. Industrial Engineers 20 (1); 1-8.
processes with model uncertainty; Quality Engineering 16(3); 437-450. Weis P.E. (1957), An application of a two-way X-bar chart; Industrial Quality Control 14(6); 23-27.
models; IIE Transactions 40(10); 957-970.
International Journal of Quality and Reliability Management 14(6); 606-615. Reliability Engineering International 14(5); 347-355. Simulation and Computation 32(4); 1285-1314.
of Advanced Manufacturing Technology 26(1-2); 109-116. Institute of Industrial Engineers 20(5); 481-493.
charts; Applied Stochastic Models in Business and Industry 22(5-6); 503-517. Journal of Advanced Manufacturing Technology 31(11); 1169-1180. Loss Prevention in the Process Industries 20(1); 15-25.
adjustment; Expert Systems with Applications; Accepted. assignable causes- the cause-selecting control chart; ACTA ELECTRON- ICA SANICA 2; 1-10. Quality Congress Transactions. American Society for Quality Control; 175-185.
charts; Journal of China Institute of Communications 6; 31-38. Newsletter of Wursberg Research Group on Quality Control 4; 58-70. Transactions. American Society for Quality Control; 594-599.
Business, Department of Total Quality Management, Aarhus, Denmark. regression adjustment methods; IIE Transactions 40(2); 109-121.